It takes hard work, discipline, time and focus: something that is in short supply in every organization. Discipline of execution is a critical element here. In today’s fast paced environment, we have become predisposed to instant gratification and attention getting activities. As a result, many organizations and leadership teams feel the need to introduce something new on a frequent basis. Something that will gin the troops up and get their attention as well as the attention of the higher ups. Disciplined thought and disciplined process, no matter how boring that might be, is as important as the strategies and tactics themselves. Level 1: During my career, I have been in many long discussions about the interrelationship between Mission, Vision, Values, Strategy, etc. What comes first and drives the rest? Certainly, it can be argued that many great companies have started on a single premise. I won’t attempt to sway anyone on their way of thinking here, because it doesn’t really matter what comes first: What matters is the interrelationship between all of these elements, because each one of them gives people inside an organization insight on how to proceed. I will explain further in the next chapter. After a company has defined its business strategies, it needs to know what roadblocks are going to stand in the way of effective execution. The first level of activities involves understanding the current state of the business and the requirements of its life cycle stage. It requires fact finding about the mindset of the stakeholders and a thorough understanding of current and future customers. 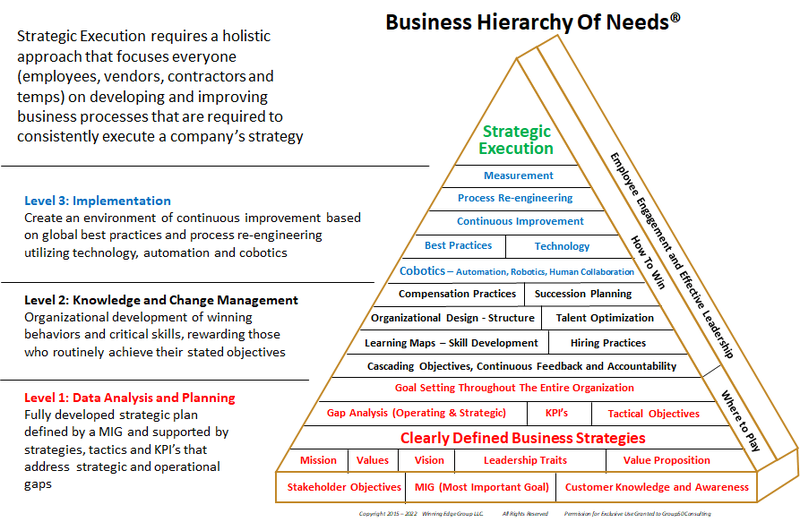 Notice that competitors are not shown in the Business Hierarchy of needs. This will be viewed by some as a major oversight and maybe it is. My view is that the competitive landscape defines the expectations of the customers. If you know what they are thinking and what they want both now and in the future, successfully implementing your strategies will take care of the competition. Responses to competition tend to be more tactical in nature, not strategic. Having the strategy defined and having the information about stakeholders and customers in hand, the company can now get to the work of identifying the gaps (products, services, business processes, organization, etc.) that stand in the way of effectively implementing strategy. Here is where Mission, Vision, Values and Leadership Traits play an important role, because they define the how’s and why’s for addressing the gaps that exist in the organization. Further action in level one provides the fundamental information required to define tactical objectives and define the appropriate key performance indicators which will allow goal setting and measurement throughout the entire organization. Measurements must be tied to the strategic and tactical objectives of the company. They must be measurable so the management team can keep score and they must be attainable in bite size chunks of time and effort. Level II: While we may be able to identify gaps, goal setting and measurement provides more insight into the operational gaps that exist with each stakeholder in the organization. One of the critical failure points in execution is the lack of focus on understanding what the needs of the stakeholders are, assessing their capabilities, upgrading their skill sets and managing them to the company’s strategies. It is also important to have a score keeping system in place that stakeholders use to understand where they are relative to implementing their strategic objectives. There are a some very good tools out there such as (Cascade – the tool we use) and others as well. Level II is all about knowledge management and measurement. Some shortages in skills and knowledge are easy to identify as a result of creating strategies and focusing on the identified strategic and operating gaps from Level 1. Acquiring a company, proceeding into new markets, inventing new technologies, implementing new business systems, etc. usually require additional resources and skills, so those can be planned for tactically. But, those are the obvious ones. Organizations typically “stop short” because of their inability to see and respond to the not so obvious things such as the performance of all the various stakeholders and their inability to track the overall status of their strategic initiatives. In the first level, we talked about an initial gap analysis which is done at a point in time and is solely focused on identifying the gaps between the current state and the future state that is defined by the company’s strategies. A properly implemented measurement system that is focused on measuring the organization against the implementation of its strategic initiatives will provide the next level of gap analysis. This is what I call the “operating gap analysis”. Shortcomings in performance are easily identified and the management team can make decisions on how to deal with these gaps. Earlier I spoke about discipline. The discipline required in this level is the discipline to deal with a lack of performance to objectives in a timely manner. There are many forms of dealing with these operating gaps. They might include different compensation policies, new hiring practices, the creation of learning maps for various functional organizations with a focus on improving skills, parting company with individuals, changing suppliers, or the redesign of specific organizations. Also included should be succession planning. I have not come across a company that does it well or consistently, so I am sure that readers will provide their thoughts for me on this. Level III: Perhaps the most difficult level in the Business Hierarchies of Needs is level III. This level is all about change management. While Level II addresses gaps in the organization, Level III focuses on the operational gaps that exist in business processes. Change in business processes are a given and the company needs to be in a position to deal with those changes. It needs to have people who are capable of implementing change based on the dictates of the KPI’s that were set in Level I, the company’s strategic needs and the current state of various business technologies. In companies we have dealt with, changes are often made without utilizing the precepts of Levels I & II as the litmus test for how to prepare for change, its implementation and managing that change. This is especially true for large systemic changes in technology such as new enterprise systems. In general, companies implement change in their organizations without doing the necessary work to optimize that change to their strategic needs. One client I am working with implemented a new ERP system requiring that the supplier redesign the system interfaces and processes to support their current business practices instead of doing the up-front work required to fully utilize that best practices that the system was designed around. As pointed out, there are three levels of need in a business. Each progressively more complex and required to be worked in a specific order. The Business Hierarchy of Needs is a pictorial of the methodologies a company should use if they are going to develop a culture of execution and not “stop short”. About Group50 and the author: Group50’s focus is on strategic executionTM. Jim Gitney, the CEO of Group50® has worked with organizations of every size in support of their movement to a culture of effective strategic execution, and realize their potential in the marketplace. You can request more information here, email info@group50.com, or call (909) 949-9083 for more information. To see the services that Group50 provides, go to our home page.